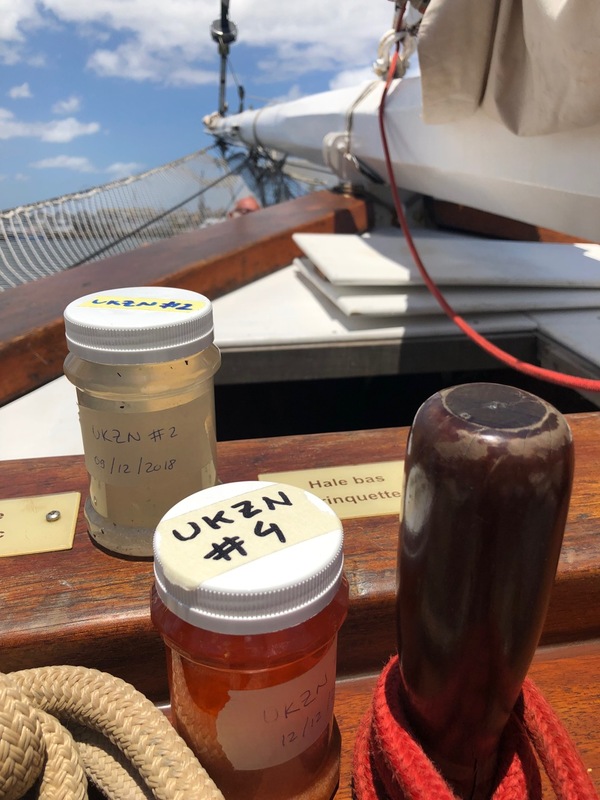 Dr David Glassom from KwaZulu-Natal University was on board Fleur de Passion from Durban to Knysna in November 2018 in the frame of his research on the use of plastic debris by juvenile fish as potential for species migrations or invasions in a time of global change. We met him in Durban in early October when the expedition was invited to participate in a two-day workshop organized by the South African Institute on Environmental Health, with the support of the embassy of Switzerland. And very soon, it appeared that the rest of journey along the West coast of South Africa towards Cape Town would be an interesting opportunity for him to explore further the phenomenon. 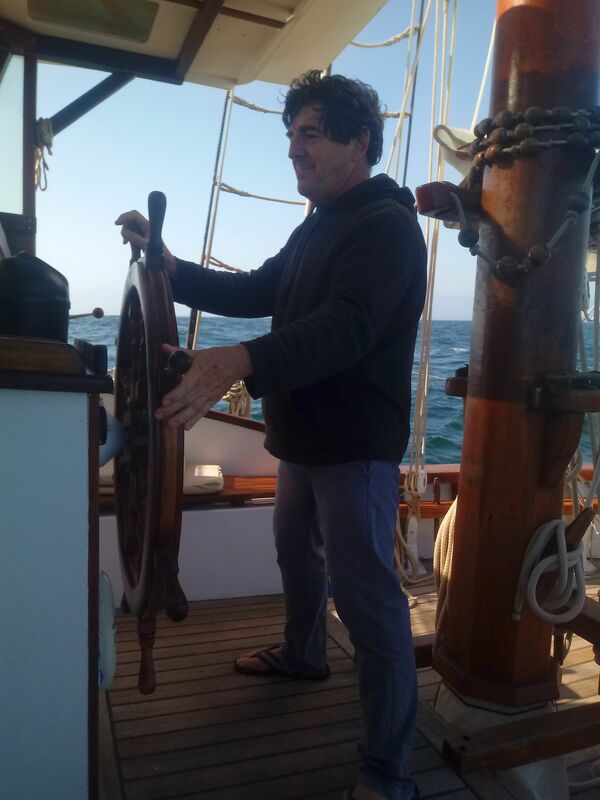 But before he can share initial results, let’s join David on board Fleur de Passion to experiment through his own words his « first trip on a large sailing vessel and one of (his) greatest experiences ». « I was a bit nervous, as I am known to get seasick at times. But I took tablets for the entire journey and they worked – I felt no sickness at all. Travelling under sail was unique – the motion is completely different from being under engine power. Raising the sails, tacking the ship (no winches or mod-cons, just pulling on the ropes), was like living a boyhood fantasy. 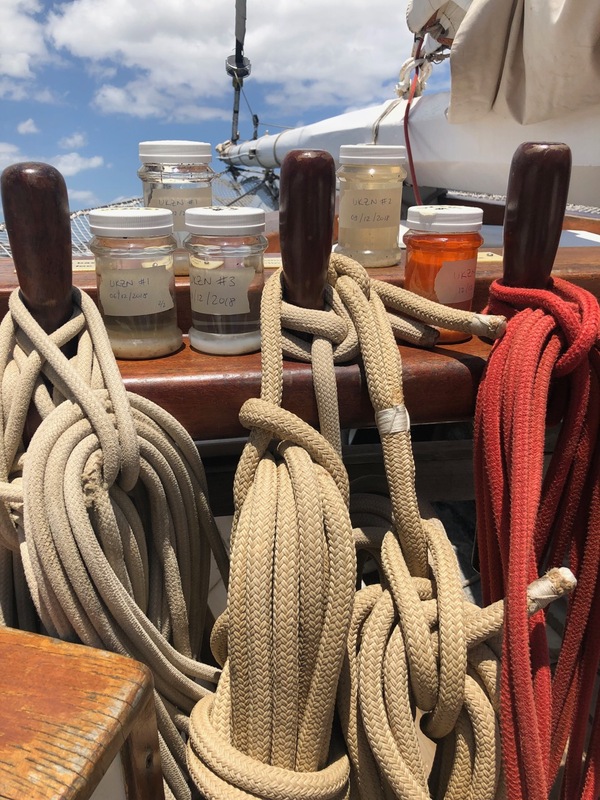 Although Pietro (skipper) did not assign me to specific shifts (my main job was cook’s assistant), I did link up with Candy (second mate and scientific coordinator) and Francois (passenger from Geneva) and tried to join their shifts at the helm. Learning to steer the Fleur was quite a steep curve – the first time I tried it, the rest of the crew must have been very confused, we were doing a zig-zag pattern while I tried to figure out the way the ship would respond. Steering under sail for the first time was a whole new learning curve, as keeping the right angle to get the wind in the sails was a bit of a challenge. The accommodation was comfortable (the boat wasn’t full, so I had a cabin to myself). The food, compliments mainly of Pierre (cook) was fantastic and I found the entire crew really friendly and hospitable, not to mention professional and, even without any sailing experience I could see that they were highly competent. It was great especially to learn the history of the Foundation Pacifique from Pietro, who, it turns out, helped someone I know do research on whales many years ago. Communication was a bit of a problem; most of the crew spoke English, but a few didn’t and my French is non-existent – I did pick up a few words and phrases along the way. Between Durban and East London, we were a bit far offshore to really see the coast, but from then on we were in view of the coast most of the time. I have never seen that part of the coast from the sea before, so that was also a new experience for me. The last part of the trip was really special – we were close to the coast and the cliffs between Plettenberg Bay and Knysna are really spectacular. Going through the entrance to Knysna lagoon (known as the Knysna Heads), was a bit nerve-wracking, with cliffs on one side, breaking surf on the other and a narrow channel that is just deep enough for the draft of the Fleur. A friendly guy from the National Sea Rescue Institute (NSRI) gave us some helpful guidance. At Knysna in late November 2018, David had to leave the boat due his need to back in office. But while on board, he had briefed the crew so that more samplings could be made until Cape Town.